In 1962, Ralph Colin, an art collector and lawyer, saw an American art scene that lacked a cohesive, binding entity among its art dealers. He enlisted a young associate in his firm, Gilbert S. Edelson, to help him and together they persuaded a number of top American art dealers to unite, forming the Art Dealers Association of America (ADAA). ADAA’s The Art Show, one of the first art fairs, celebrated its 20th year in February of 2008 at the Seventh Regiment Armory on Park Avenue. The opening preview constituted a benefit for Henry Street Settlement, founded in 1893 to help families in urban poverty achieve better lives for themselves and their children. “It was an unparalleled success in every way,” says Roland Augustine, president of the ADAA and founder of Luhring Augustine, of last year’s fair. Many of the 70 galleries reported sold out exhibitions, some within hours of opening. 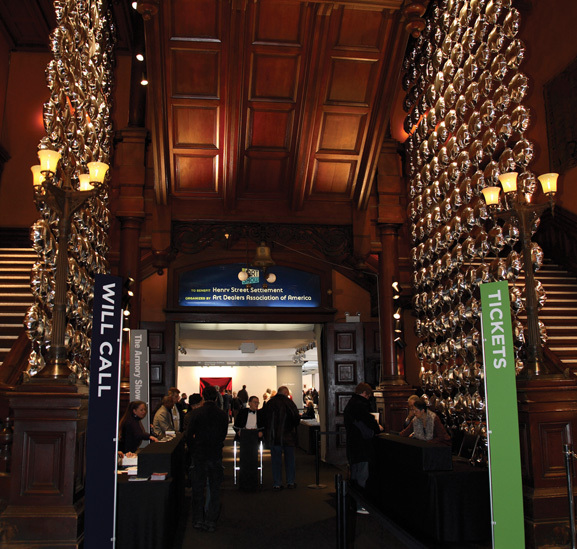 As for the show’s venue of 20 years: “We try to keep the atmosphere of the Park Avenue Armory, which is a very special, unique setting that provides for an intimate exhibition experience that people don’t ordinarily find in other fairs,” explains Linda Blumberg, the executive director of the ADAA.